Take a chance on love when the “laugh out loud funny” (Los Angeles Times) romantic comedy Man Up arrives on Blu-ray (plus Digital HD), DVD (plus Digital) and Digital HD February 2 from Lionsgate Home Entertainment. Featuring the “hilarious and heartwarming” (The Spinoff) Simon Pegg (The World’s End) and Lake Bell (Netflix’s “Wet Hot American Summer: First Day of Camp”), Man Up is “a smart and winning rom-com” (US Weekly). The film follows Nancy (Bell), a charming, albeit awkward single woman determined to add spontaneity to her drab love life. When she accepts a blind date from a misinformed stranger, Jack (Pegg), she finds that giving love a chance can lead to the most unexpected of romances. 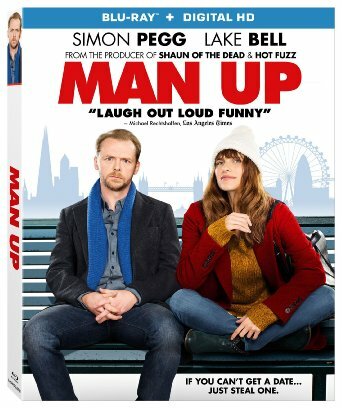 From the producer of Shaun of the Dead and Hot Fuzz, Man Up will be available on Blu-ray and DVD for the suggested retail price of $19.99 and $19.98, respectively. 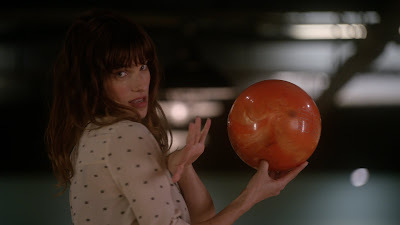 Nancy (Lake Bell) carries a notebook reminder her to take chances. In her hotel room ready for a friend’s engagement party she would rather order room service and watch Silence of the Lambs than meet the single guy her friends want to set her up with. Nancy’s sister reminds her to put herself out there and spice up her love life. Later, Nancy shares a train with a young woman named Jessica. Jessica is upbeat and optimistic and everything that Nancy is not. Jessica looks forward to a blind date that will be meeting her soon. Through a strange series of events, Nancy runs into the man named Jack (Simon Pegg) who is to be Jessica’s date. There is an immediate connection and Nancy fails to tell Jack that she’s not the girl he’s looking for. She basically hijacks another woman’s date, pretending to be the 24 year old triathlete. Eventually, the secret is out and Jack heads off to meet his real date but can’t get his mind of the “wrong girl” he just spent an amazing day with. Man Up pleasantly surprised me. I didn’t think I would like the film but this is one instance where I am glad I took the chance. 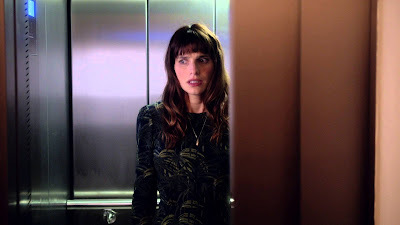 Lake Bell expertly delivers her performance of the awkward Nancy and completely nails the British accent. Simon Pegg is known for his comedic roles, but he has some touching, dramatic moments that you won’t see coming. The accents are spot on, but do not leave an American audience missing much of the dialogue like other British films can do. The film is cute, sweet, and well worth the time for a fan of romantic comedies. The Blu-ray is presented in 1080p High Definition with a 16x9 widescreen (2:40:1) ratio. Almost the entire film takes up only a single day in the characters’ lives. The day does take them into dark bars, bowling alleys and racing through the streets. Regardless of the lighting conditions, detail is good. Skin textures (including imperfections) are accurate and consistent. Man Up’s 5.1 DTS-HD Master Audio sound is adequate throughout the film. Dialogue is intelligible and consistent. Inside the dive bar, Duran Duran plays with the exact audio quality you’d expect. While the film doesn’t have a lot of variety to test your surround sound it does hold up to all the romance, action and comedy of a day in the life of Nancy and Jack. Gag Reel (6:23) – Silly moments on set with the cast. Simon and Lake Interview Clips (4:05) – The stars joke their way through a handful of questions about dating and the film. The Seven Beats of Man Up (40:34) – The filmmaking team discusses Simon Pegg coming on board, finding the right Nancy, chemistry, the importance of Lake’s accent, the seven beats of the romantic comedy and more. 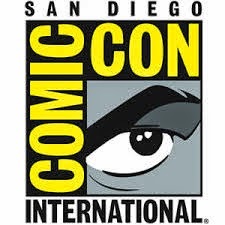 Also from Lionsgate – Trailers for other films. When I read other reviewers use lines like “laugh out loud funny” I roll my eyes. I feel like every movie with a joke in it gets called laugh out loud funny and I don’t usually agree. Although the way the main characters meet is pretty unusual this film comes across as believable. Nancy and Jack are two very flawed people who don’t necessarily know what they need. It’s fun to watch the romance they never expected unfold and to follow along as the characters are late to realize it. I don’t consider myself a fan of Simon Pegg or Lake Bell but they are perfect for these roles. This is a romantic comedy I will definitely put into my re-watching rotation.